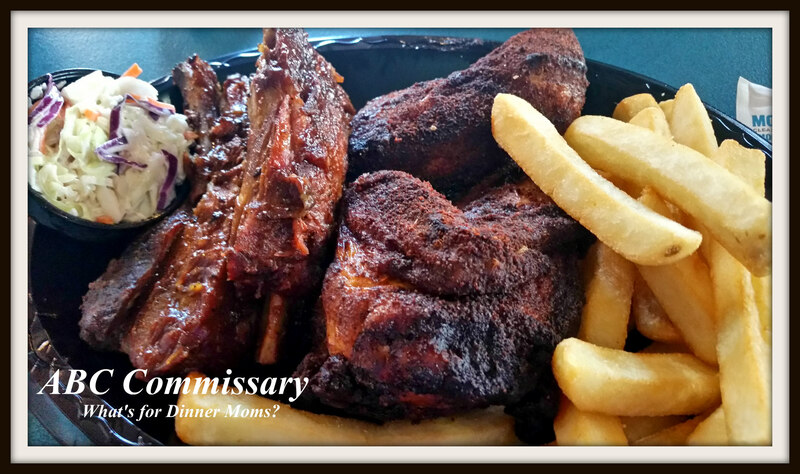 ABC Commissary – What's for Dinner Moms? We recently returned from our Walt Disney World vacation. We add the regular dining plan to our trip. This gives us 1 counter service meal, 1 table service meal, and 2 snacks each day per person. It also gives us a refillable mug to use at the resort. Disney is continually tweaking their meal plans. This year the counter service meal no longer includes dessert which was usually a small cup of carrot cake, chocolate cake, or grapes while in the parks and a piece of cake or cupcake at other sites. I didn’t miss dessert at all and thought that the extra snack credit was a much better option for us. We could decided when, where, how to use the extra snack credit for dessert rather than carrying four little cake cups in our backpack until they opened and melted all over everything. Our first foray into counter service dining this trip was at the ABC Commissary in Disney Hollywood Studios (DHS). My children had gone on ahead of us to ride Star Tours: The Adventures Continue. We wandered around a bit before heading over to dinner. Three of us tried the steak while my daughter had the chicken and ribs meal. 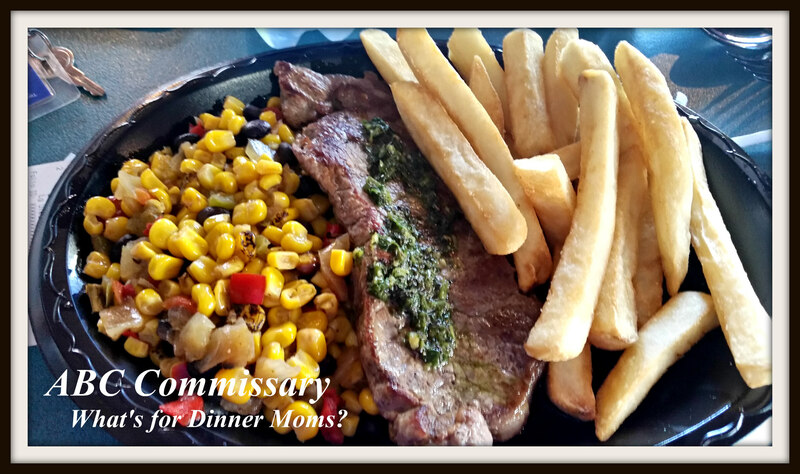 All three of us agreed that the best part of the steak meal was the roasted corn side dish. It was flavorful and added a great deal to an otherwise bland meal. Don’t get me wrong the steak was okay but it was counter service steak. It was cooked between medium-well and well done. I prefer a much rarer steak and there wasn’t a point to ask for how you wanted it cooked. The fries were well, fries. Nothing special. So, the corn stole the meal. My daughter really liked her chicken & ribs meal. There was enough for 2 people to share. She was a bit hesitant with the dry rub on the chicken as that was not what she was expecting. It was a bit spicy but the chicken was moist and tender. The ribs were her favorite part of the meal. She thought they were far better than she was expecting them to be. Even without dessert we had plenty of food for diner. As the temperature was 92 degrees while we were eating dinner even in the air-conditioned dining hall we really didn’t want a heavy dessert and appreciated having the snack credit to use later when it was cooler and we were hungry for something sweet. They started the meal plans about 12-15 years ago. It’s nice because the majority of your food and snack costs are known up front. Sometimes it works for families, sometimes it doesn’t. We love to eat so it works for us. Thanks for sharing! It is so cool that we get to see parts of your trip! Thank you! Disney is such a large part of our life I have to share. I am enjoying reading about your trip and the meals your are having.